Vexed Logic!? 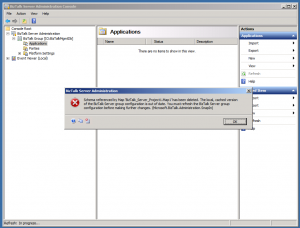 - BizTalk » Blog Archive » Schema referenced by Map ‘Map Name’ has been deleted. The local, cached version of the BizTalk Server group configuration is out of date. Schema referenced by Map ‘Map Name’ has been deleted. The local, cached version of the BizTalk Server group configuration is out of date. Schema referenced by Map 'BizTalk_Server_Project1.Map1' has been deleted. The local, cached version of the BizTalk Server group configuration is out of date. 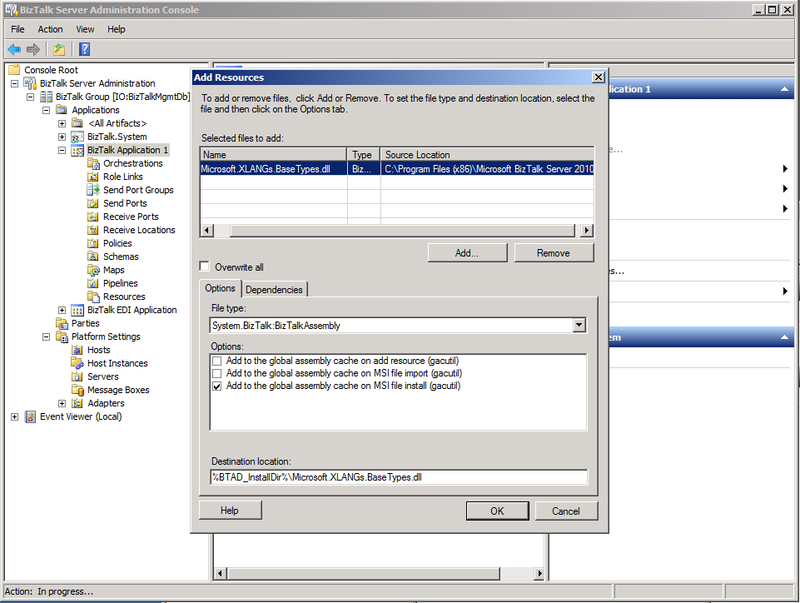 You must refresh the BizTalk Server group configuration before making further changes. I must say, this is probably one of the most frightening BizTalk errors that I’ve experienced. 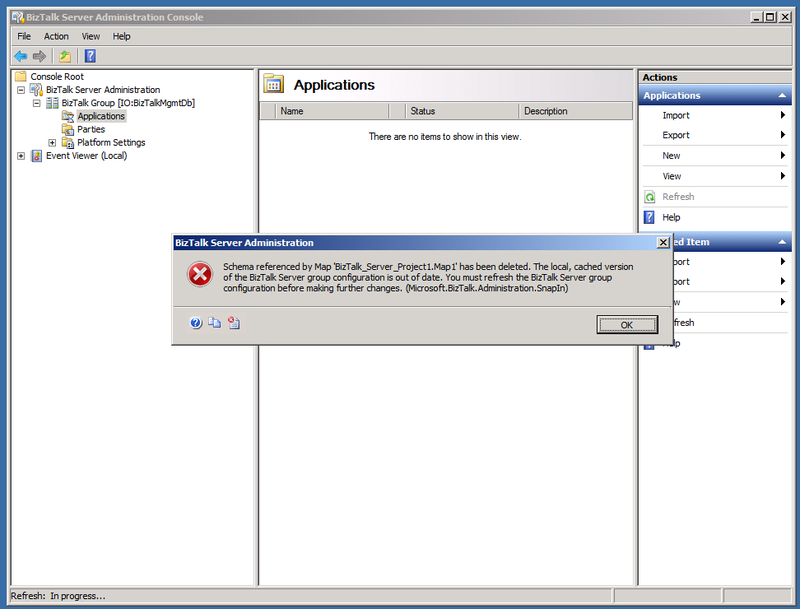 It’s not the error itself… it’s because when this happens, all of your deployed applications seem to disappear. The Applications tree won’t expand if you attempt to view them in the Administration Console. I’m actually glad that it has happened to me once before, since just this past week it occurred when I was deploying something to production for my employer. You’d figure that you could actually click the “For help, click” link, and… well, get some help. Not exactly. There is no additional information about this issue in the Error and Event Log Messages or Knowledge Base databases at this time. You can use the links in the Support area to determine whether any additional information might be available elsewhere. So, the first time this happened, it required a decent amount of searching since there weren’t any concrete solutions. I had heard of people saying they had to entirely uninstall and reinstall BizTalk Server, restore from backups, and manually edit the BizTalk Server database tables. My options were limited due to the fact that I couldn’t do anything as far as re-deploying or viewing my existing applications. I decided to try suggestions that mentioned modifying data in one of the BizTalkMgmtDb tables. I deleted an entry from the BizTalkMgmtDb.dbo.bt_MapSpec table, which actually resulted in being able to refresh the applications list again and get more than an empty list. However, I noticed that deleting an entry from this table actually caused one of my maps to be removed from the Administration Console. This is a map that I’d actually like to use, so I decided to attempt to redeploy the application. Blah… this resulted in this whole error process occurring again. So, deleting an entry from the bt_MapSpec table was just a partial fix. I was able to narrow down the cause of the issue to a BizTalk map that I created that used the Microsoft.XLANGs.BaseType.Any schema type. Apparently, this DLL is in the GAC, but it actually isn’t added to the BizTalk Group as a BizTalk Assembly. This is what I’m assuming that the error is referring to by “schema referenced has been deleted”. Basically, it is unable to locate an assembly in the BizTalk Group that is used in a map. If you receive the error and are at a point where you can’t refresh the applications list or undeploy/redeploy due to the error, I found that simply restarting the BizTalkServerApplication host instance allowed me to refresh the applications list. Then, I added Microsoft.XLANGs.BaseTypes.dll as a BizTalk Assembly to BizTalk Application 1. This is done by right-clicking BizTalk Application 1 -> Add -> BizTalk Assemblies… -> and selecting %BTSINSTALLPATH%\Microsoft.XLANGs.BaseTypes.dll. Voila! Everything appears to be well now. No manually editing data in database tables or BizTalk re installation required. This entry was posted on Friday, May 20th, 2011 at 5:36 pm	and is filed under BizTalk. You can follow any responses to this entry through the RSS 2.0 feed. You can leave a response, or trackback from your own site. Good post and timely as I experienced the same issue today… Thanks for your help. I was able to get this to work without the last step though of adding the assembly. Thanks. This was really helpful!